If you’re facing criminal drug charges in Linn County, you need an experienced lawyer by your side. Because federal and Iowa state laws cover a wide range of drug charges, you should select a drug crime lawyer in Cedar Rapids who knows the ins and outs of criminal law. Depending on the charges you’re facing, you may be asking yourself what the differences between federal and state drug charges are. State drug laws are more specific and pretty straightforward as long as they don’t conflict with federal drug laws. Those facing federal drug charges usually receive longer sentences, whereas individuals facing state drug charges may receive a short-term sentencing. Sometimes state drug charges result in a probation. 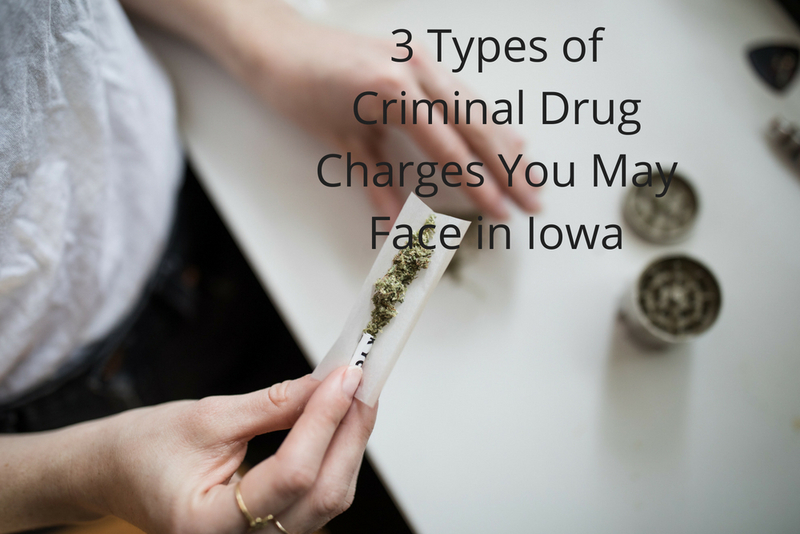 The truth is that it doesn’t really matter what kind of drug charge you’re facing because a conviction in the state of Iowa can have severe consequences and remain on your record for years to come. Today, we’re taking a look a five of the most common types of drug crimes and what they could mean for you. “Drug paraphernalia” is the term used to describe the equipment used to prepare, inhale, inject, or conceal illegal drugs. This term may also refer to any equipment used to conceal or manufacture drugs. Per state and federal law, it’s illegal for an individual to sell, import, or export drug paraphernalia in any form. The tricky part about paraphernalia is that a lot of items are designed in such a way that they look legal. For instance, most of the bongs on the market have labels that say they should only be used for tobacco. Even if you have a bong with this label on it, you could still be charged with drug paraphernalia depending on where you bought the item and what it looks like. This is why having an experienced criminal law attorney in your corner is crucial. In Iowa, the possession charges you face depend on the type of substance you had at the time. You should know that it is a crime according to the state and federal drug laws to possess any controlled substance such as cocaine, marijuana, or heroin. If you are charged with possession, the consequences will likely not be as severe as those being charged with possession with intent to distribute. Were you involved in any step of the manufacturing process for an illegal substance? You could face criminal charges if you said yes. If you were delivering illicit drugs (whether you get paid for it or not) then you could also face delivery charges by the state of Iowa or at the federal level. Keep in mind that prosecutors have to prove intent to manufacture and possession in order to convict the alleged manufacturer. If a drug manufacturer is convicted, they could face some heavy fines and prison time. Many people make the mistake of thinking that marijuana doesn’t have the same harsh consequences as other substances, but in Iowa, marijuana is still considered a controlled substance so there is still ramifications. Cory Goldensoph, P.C. is an experienced lawyer who specializes in criminal charges. Cory has the knowledge and experience it takes to navigate the criminal aspects of the law. To speak with Cory about your case, give him a call at 319-364-5525 today to discuss your rights and options.